People in the U.S. are entering an age of potentially devastating and deadly forces merging in our hospitals. Almost all Americans will receive care in a medical setting at some point, and antibiotic resistance can affect anyone. Antibiotic resistance is the ability of microbes to resist the effects of drugs, resulting in germs not being killed and their growth not stopping. Antimicrobial agents, which have greatly reduced illness and death, have been used for the last 70 years to treat patients who have an infectious disease However, these drugs have also been used so widely, and for so long, that the infectious organisms the antibiotics are designed to kill have adapted to them, making the drugs less effective. With at least 2 million people becoming infected with antibiotic-resistant bacteria every year, resistance to antibiotics and health care-associated infections (HAIs) are increasing the death rate back up to 100,000 annually. Both antibiotic-resistant organisms and HAIs are mostly preventable. “New data shows that far too many patients are getting infected with dangerous, drug-resistant bacteria in health care settings,” said Tom Frieden, M.D., director of the Centers for Disease Control and Prevention, in a news release. According to the CDC, HAIs are major causes of both morbidity and mortality. Even with a significant improvement in the HAI death rate over the last few years, the US seems to be plateauing at a death rate of 75,000 people annually. Organisms resistant to antimicrobials continue to emerge, which many believe will lead to untreatable diseases. 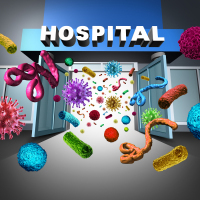 Like HAIs, antimicrobial-resistant infections lead to a significant increase in both medical treatment and consequent expense of personnel and drugs, and extended hospital stays. Taking time to educate the patient is a key ingredient in successfully reducing the amount of antibiotics being used, and will reduce the likelihood that resistance will develop during therapy. Drug-resistant infections can be prevented through immunization, safe food preparation, handwashing and using antibiotics as directed when necessary. Preventing infections also prevents the spread of resistant bacteria. Many hospitals are incorporating big-data strategies to help with treating patients, Keeping records of all antibiotic-resistant infections, causes of infections and whether there are particular risks that caused someone to get a resistant infection will help experts develop scientific strategies to prevent those infections and prevent the resistant bacteria from spreading. Assign a staff professional to remind physicians to prescribe antibiotics only when necessary. This is perhaps the single most important action that needs to be taken to greatly slow down the development and spread of antibiotic-resistant infections. According to the CDC, up to half of the antibiotics used by humans are unnecessary, inappropriate and make everyone less safe. Prescribe or administer the appropriate antibiotics to combat this issue. Stay ahead of the game by sharing medical research with the medical staff concerning new drugs and how to appropriately use them. Although antibiotic resistance will continuously evolve with bacteria, health care personnel will always need new antibiotics to keep up with the resistant bacteria. Developing new diagnostic tests to track the development of resistance plays an equal role in slowing down the spread of resistant bacteria. When used appropriately, antibiotics are effective drugs that fight bacterial infections. The overuse and misuse of antibiotics has led to a decrease in antibiotic effectiveness and the resistance of some microorganisms to these drugs. Researchers believe we are heading toward a diff if overuse continues, and treatable disease will once again become untreatable. Similarly, HAIs must be reduced since they often lead to prolonged illness and sometimes death. Hospital personnel must continually educate all of their internal teams concerning safe work practices within all areas of the health care facility. Infection control and prevention training must be continual to work toward changing bad habits and developing new ones. We have all heard the constant rant concerning handwashing, but recently I attended an in-service training meeting with the environmental services staff at a major hospital. One EVS staff member who attended the meeting entered the board room after disinfecting a patient room with his used gloves still on his hands. When I questioned him about it, he responded with, “Oh, I forgot,” and took them off. He had already touched a variety of surfaces in a room where many people come in contact with those surfaces.